During my seven days at Jonathan Woolston’s workshop I wanted to finish a restoration project that I had been pursuing over the whole year. Before I came to Jonathan I had already fitted two new cheek patches to an old German scroll as the old ones had to be removed. 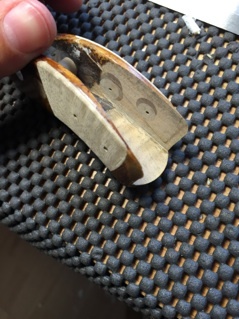 What was still missing was an edge repair that should be replaced with better fitting wood and a neck graft. Jonathan taught me a lot about matching wood and what to look for – especially in maple, where it is crucial to match the medullary rays as exactly as possible. 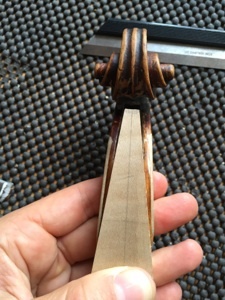 I also learnt a lot about necks – how to position them on old instruments, how to get a neck graft fitting 100% and how to find the bumps and wobbles that keep the two pieces of wood from fitting. During the fitting process, Jonathan also taught me how to judge if the scroll is central to the graft and the benefits of having a fingerboard spot glued on when cutting the pegbox. I feel a lot more confident now in my understanding of necks, as I also did a neck reset on another violin on which I had already done a neck graft before I came to the work experience. 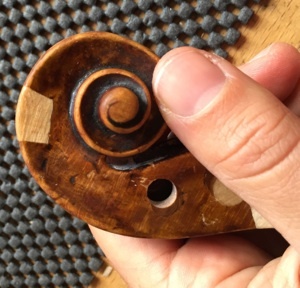 I also realised how important it is to assess a repair or restoration instrument properly before even starting the work, checking the bass bar position and how it relates to the rest of the instrument.